Maximise current business revenue whilst opening up other areas of business. Save time, stream line your processes and increase the amount and accuracy of information you record. Present a more professional image to customers. Customisable price matrix ensuring accurate estimates. Capture all customer and estimate information sent to dedicated email addresses. 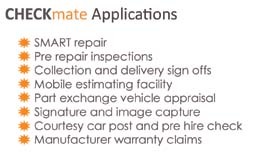 Capture damage through photos linked to estimates and job notes all on the device and sent via email, prited off or integrated into your bodyshop management system. Capture customer signatures on the device which are automatically date and time stamped and can be used to sign off deliveries, collections, handovers, damage appraisal or courtesy car booking.